“Heart of the Oak” from Christian Faith Publishing author J.L. Novinsky is a touching short story about the many memories of an old oak tree, from how it came to life when a fat little squirrel buried an acorn in the soil to its “guests,” like a dog who gave birth to six babies and a father who bonds with his son. “Heart of the Oak” is a stirring story from published author, J.L. Novinsky, a passionate writer, about an old oak tree who tenderly recalls the memories he has acquired throughout the years. Published by Christian Faith Publishing, J.L. 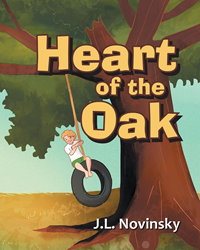 Novinsky’s new book is an enchanting story that features the heart of an old tree that encounters many guests and sees different wonders as it weathers the seasons and even a tragedy—a devastating fire. Novinsky writes that the heart “hurts when there is no one to care for, no one to love.” This gripping line shows readers that one of the ways of having true joy is to sincerely care for others and love them truly. View a synopsis of “Heart of the Oak” on YouTube. Consumers can purchase “Heart of the Oak” at traditional brick & mortar bookstores, or online at Amazon.com, Apple iTunes store, or Barnes and Noble. For additional information or inquiries about “Heart of the Oak”, contact the Christian Faith Publishing media department at 866-554-0919.